﻿ Solution to Where's Freddie? 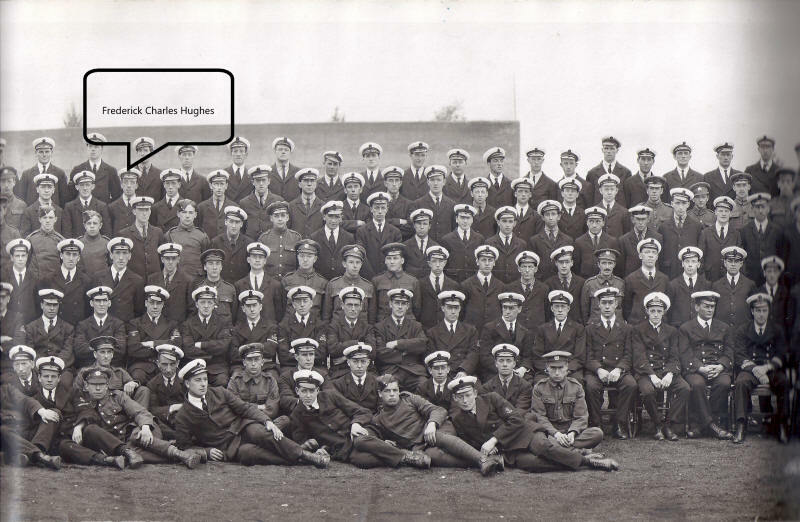 Frederick Charles Hughes was born on 25 February 1885 in Holloway, London. He was apprenticed as a cabinet maker in October 1899 and by 1909 he was making and restoring furniture in a high class workshop based in Soho Square, London. In May 1910 he married Elizabeth Froy in Hitchin and by 1911 they had two children and were living in Tottenham. Freddie joined the Royal Naval Air Service in December 1916 as a Corporal Rigger Aero Carpenter and was attached to the ship President II throughout his service. The photograph of his unit was taken in August 1918 at the Royal Naval Airship Construction Station in Wormwood Scrubs although by that time it had become part of the Royal Air force. He was demobilised on 3 March 1919 at Chingford. On 16 February 1922 his wife Elizabeth gave birth to their third child, Joan Elizabeth Hughes. Joan married Frederick William Baker in 1942 and their first child was Trevor Baker who was born in Lemsford, near Welwyn. Trevor’s grandfather Freddie, spent the last few months of his life living in Watford where he died in November 1956. Where’s Freddie? In 1918 he was standing in the second row from the back as shown by the bubble in the photograph. The winner of the carnival competition was Ashley of Hemel Hempstead whose pin was closest to Freddie with flag No. 499.